Guess What?! Tomorrow is my 3rd blogiversary! Whooooowhooo! In honor of all of you readers out there I'm hosting my very first ever GIVEAWAY! You get a chance to win a Giclee Print from my Etsy Shop! Giveaway starts Thursday May 16th 12:00 AM Mountain Time and ends Thursday May 23rd 12:00 AM Mountain Time. I'll announce and contact the winner on Thursday May 23rd. Make sure to visit the Giclee Prints Section of my shop and leave me a comment on this post about which one is your favorite and you could win it! Don't forget to leave your email with your comment so I can contact you if you win! I love the delicate Pink Blossoms Branch print. I honestly hate to choose, because frankly I love them all, but since I am supposed to pick one, I will say the Purple watercolor flower. As aside note, the VW big looks exactly like one we had when I was a child and I have such memories, some good and some bad, of that car! I love your work. Thank you for the chance to win one of your prints and Hapoy Blogoversary to you! You are so talented! I love the Purple Water Color Flowers! Thanks for the opportunity to win and congratulations on your blog anniversary! The elephant would be a perfect going away gift for my elephant loving friend! Congratulations on your blogiversary and thank you for the giveawa! I love the elephant, it would fit in nicely with all of the other things on my elephant shrine! I LOVE, LOVE both the birdies and the purple watercolor flower!!!! I just found you a few days ago and so glad I did!!!! Love your work!! I adore the golden yellow pears - although I love all your pieces. Oh my, so many beautiful choices...my first would be the purple watercolor flower, then the pink blossoms...but, then the birds are so sweet...the bicycle so cute...you see my dilemma...thanks for this opportunity! Darn, I got so excited I forgot to leave my email address cabjuhasz(at)gmail(dot)com - thanks again. I really love the elephant print! My baby's room is in elephants and girraffs and it would be perfect in her room! Love the prints - good luck with your Etsy shop! I'm loving the yellow wood warbler bird! Very nice! Congrates on your blogiversary Elise!I love that small yellow birdie most. 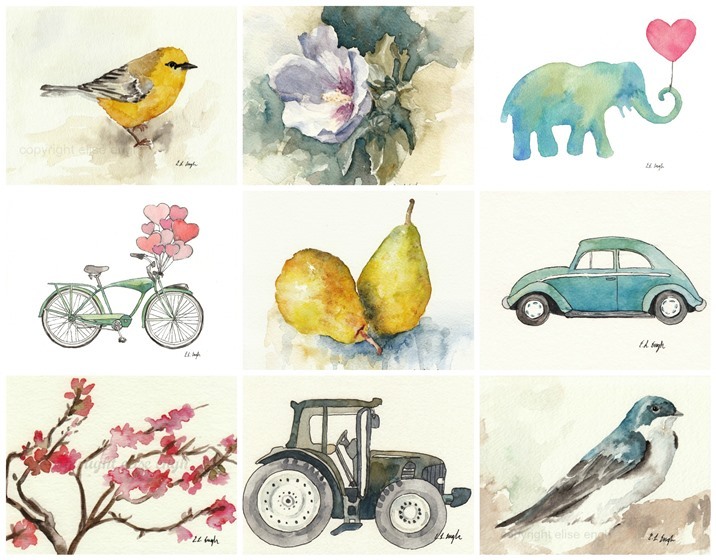 Beautiful watercolors... the elephant is my favorite! I particularly like the Blue Tree Swallow. so pretty! My favorite is the blue tree swallow. Such beautiful work. I would love the Purple Watercolor Flower. lately I have had a desire to raise chickens and own a tractor. Since I live in a city I don't think the tractor is practical. My favorite giclee is the green and blue tractor. I like the bike with heart balloons! I love the green bike with the hearts....it makes me smile to look at it. I love all of the prints, they are each so wonderful. But since I have to pick just one, my favorite favorite is the Blue Tree Swallow. I think it's lovely! Its a tie between Pink Blossoms Brand, VW Beetle, Bike with Hearts, and the Elephant. I would probably have you choose! I love the yellow wood warbler. Beautiful work! Love your art. Thanks for the chance to win. Love the Yellow Wood Warbler Bird!! I love the Green Bike giclee print! I love seeing the Warblers return to our area in the spring. The yellow wood warbler is my favorite. Pink Blossoms Branch is my favorite. I love it, hope to win! Congrats and thank you for the give-away! Watercolor Blue and Green elephant and both birds were sooo pretty ! I love these! Congratulations on your three-year blogiversary!!! I love all of them; how can I choose? The birds are adorable! So is that gorgeous magnolia flower! Tiny yellow bird, (second choice - blue bird). Love your birds, especially the blue tree swallow. Made sure to save your shop in my "favorites" too. I'll be back! Congrats! Love your shop too. It's hard to choose but the little yellow bird is so sweet, it makes me happy! That's a hard choice. There are numerous ones I like, but I lean towards the Watercolor Golden Yellow Pears. your pink japanese blossoms are soo pretty! i love that one!